ACKERMANN, Rudolph, 1764-1834 – publisher : QUEEN SQUARE. [London : R. Ackermann, 1812]. 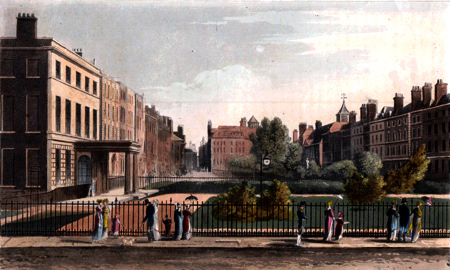 A handsome antique print – Queen Square from the north in the days of the Regency. Originally produced for the September 1812 issue of Ackermann’s fashionable magazine, “The Repository of Arts, Literature, Commerce, Manufactures, Fashions and Politics”. Aquatint on paper. Original hand colour. Engraved surface 128 x 200mm (approx. 5” x 7-7/8”). Trimmed tight and within imprint at foot; a few minor marks and signs of age, but overall in very good and clean state. A guaranteed genuine antique print. Adams 117/026. 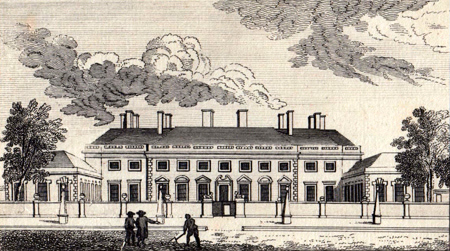 [CRAIG, William Marshall, 1764?-1829] : RUSSELL SQUARE : RHUBARB! [London : Richard Phillips, 1804]. A charming antique print – an itinerant street-seller sells rhubarb for medicinal purposes from the corner of Guilford Street, Russell Square. 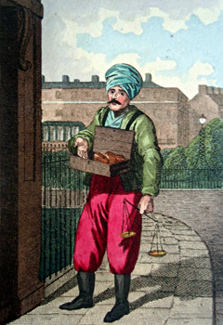 The Turk, in his distinctive turban, baggy trousers and mustachios, was a familar figure in the area for many years, selling nothing other than rhubarb and “as his drug has been found to be of the most genuine quality, the sale affords him a comfortable livelihood”. Engraved by Edward Edwards (1738-1806) from an original study by William Marshall Craig, water-colour painter to Queen Charlotte. Originally produced for Phillips’ part-work “Modern London : Being the History and Present State of the British Metropolis” (London : 1804), but here in a slightly later impression with the outer ruled border, imprint and credits burnished out. Etching and line engraving on paper. Original hand colour. Engraved surface (including single-rule outer border) 118 x 80mm (approx. 4-5/8” x 3-1/4”). Minor spotting to outer blank margins, but overall in very good and clean state. A guaranteed genuine antique print. Adams 89/048 – not listing this variant. [ENGLISH SCHOOL] : [BLOOMSBURY SQUARE] A PERSPECTIVE VIEW OF BEDFORD HOUSE. [London : ca.1770]. An uncommon antique print of old Bedford House, long since demolished to make way for Bloomsbury Square. Evidently based on the 1761 print by Samuel Wale (1721-1786), but slightly larger and with the staffage reversed. Copper line engraving on paper. Engraved surface 92 x 144mm (approx. 3-5/8” x 5-5/8”). Trimmed a little close at head and remargined, but in very good and clean state. A guaranteed genuine antique print. MORLAND, William Kendall, 1799-1875 : ST. GEORGES CHURCH, BLOOMSBURY. London : W. Clarke, 1817. A charming small antique print of the pillared exterior of the Hawksmoor church of St. George, Bloomsbury, with its extraordinary spire. Engraved by William Wallis (fl.1816-1855) from an original study by W. K. Morland and originally produced for the part-work publication “Walks through London, including Westminster and the Borough of Southwark” (London : 1816-1817). Copper line engraving on paper. Engraved surface 108 x 70mm (4-1/4” x 2-3/4”). In very good and clean state. A guaranteed genuine antique print. Adams 121/073. PRIOR, William Henry, 1812-1882 : HOSPITAL FOR SICK CHILDREN, GREAT ORMOND STREET. [London : 1878 (or later)]. An antique print of the first hospital in England solely dedicated to children, founded by Charles West in 1851. 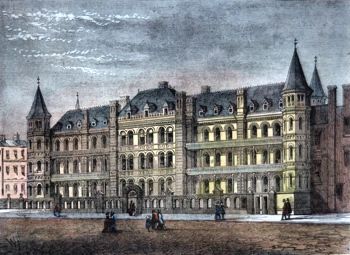 The print shows the exterior of the purpose-built new building completed in 1877. Engraved from an original study by William Henry Prior and originally produced for the part-work “Old and New London” (London : 1873-1878). Wood engraving on paper. Later hand colour. Engraved surface 105 x 143mm (approx. 4-1/8” x 5-5/8”). Text on verso. In very good and clean state. A guaranteed genuine antique print. 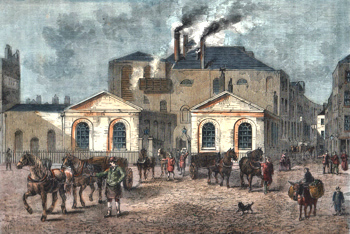 PRIOR, William Henry, 1812-1882 : MESSRS. MEUX’S BREWERY, 1830. [London : 1878 (or later)]. An interesting antique print – the Horseshoe Brewery owned by Henry Meux, which used to stand at the junction of Tottenham Court Road and New Oxford Street (the site of the Dominion Theatre). Engraved from a study (based on earlier source) by William Henry Prior. Originally produced for the part-work “Old and New London” (London : 1873-1878). Wood engraving on paper. Later hand colour. Engraved surface 144 x 210mm (approx. 5-5/8” x 8-1/4”). Text on verso. In very good and clean state. A guaranteed genuine antique print. PRIOR, William Henry, 1812-1882 : QUEEN SQUARE, 1810. [London : 1878 (or later)]. 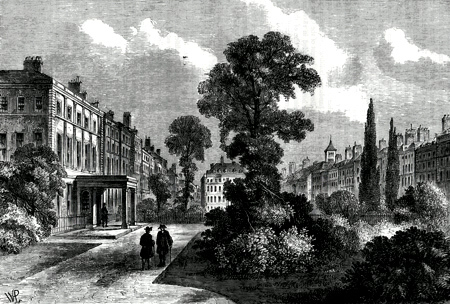 An attractive antique print – Queen Square in Bloomsbury as it stood in the early years of the nineteenth century. Engraved from a study (based on earlier source) by William Henry Prior. Originally produced for the part-work “Old and New London” (London : 1873-1878). Wood engraving on paper. Engraved surface 144 x 212mm (approx. 5-5/8” x 8-1/4”). Text on verso. In very good and clean state. A guaranteed genuine antique print. 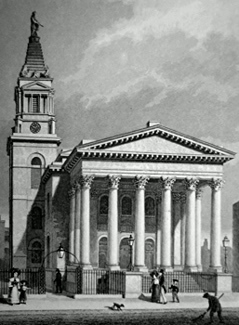 PRIOR, William Henry, 1812-1882 : ST. GEORGE’S CHURCH, BLOOMSBURY. [London : 1878 (or later)]. 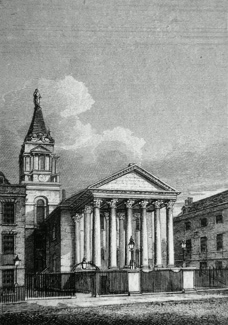 A pleasant antique print – the exterior of the Hawksmoor church of St. George on Bloomsbury Way. Engraved from an original study by William Henry Prior and originally produced for the part-work “Old and New London” (London : 1873-1878). Wood engraving on paper. Later hand colour. Engraved surface 144 x 106mm (approx. 5-5/8” x 4-1/8”). Text on verso. In very good and clean state. A guaranteed genuine antique print. SHEPHERD, Thomas Hosmer, 1793-1864 : BLOOMSBURY SQUARE, AND STATUE OF FOX. London : Jones & Co., 1831. 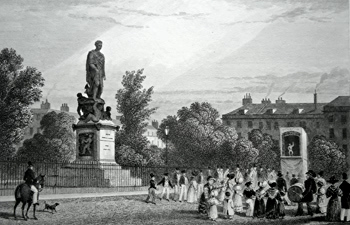 A charming antique print – Bloomsbury Square and the statue of Charles James Fox. Engraved by Charles Mottram (1807-1876) from an original study (now in the Museum of London) by Thomas Hosmer Shepherd, the master recorder of nineteenth-century London. From Shepherd’s series “London and its Environs in the Nineteenth Century” (London : 1829-1832). Steel line engraving on paper. Engraved surface 111 x 152mm (approx. 4-3/8” x 6”). In very good and clean state. A guaranteed genuine antique print. Adams 161/125. SHEPHERD, Thomas Hosmer, 1793-1864 : THE NEW CHURCH, REGENT SQUARE, SIDMOUTH STREET. London : Jones & Co., 1828. 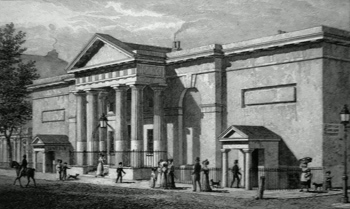 An attractive antique print – the church of St. Peter, Regent Square, with its ionic portico, built to the designs of W. and H. Inwood 1824-1826 – “a chaste and pleasing composition” destoyed in the London Blitz. 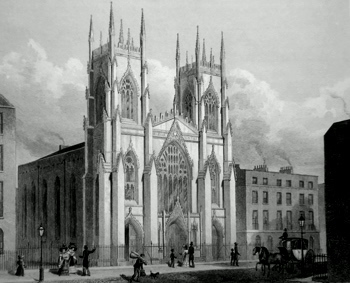 Engraved by Charles Westwood (fl.1827-1855) from an original study by Thomas Hosmer Shepherd, the master recorder of nineteenth-century London. Originally produced for Shepherd’s part-work series “Metropolitan Improvements; or London in the Nineteenth Century” (London : 1827-1830). Steel line engraving on paper. Engraved surface 158 x 92mm (approx. 6-1/4” x 3-5/8”). In very good and clean state. A guaranteed genuine antique print. Adams 178/074. SHEPHERD, Thomas Hosmer, 1793-1864 : NEW NATIONAL SCOTCH CHURCH, SIDMOUTH STREET. GRAYS INN ROAD. TO W. TITE, ESQ. THE ARCHITECT, THIS PLATE IS INSCRIBED FROM MOTIVES OF ESTEEM BY THO. H. SHEPHERD. London : Jones & Co., 1829. A handsome antique print – the gothic edifice built by Tite between 1824 and 1827 for the Church of Scotland in Sidmouth Street off Regent Square. The church was demolished in 1950 following extensive bomb damage. Engraved by William Watkins (1807-1891) from an original study by Thomas Hosmer Shepherd, the master recorder of nineteenth-century London. From Shepherd’s series “Metropolitan Improvements; or London in the Nineteenth Century” (London : 1827-1830). Steel line engraving on paper. Engraved surface 136 x 148mm (approx. 5-3/8” x 5-7/8”). In very good and clean state. A guaranteed genuine antique print. Adams 154/145. SHEPHERD, Thomas Hosmer, 1793-1864 : THE RUSSELL INSTITUTION, GREAT CORAM STREET. TO LORD JOHN RUSSELL, THIS PLATE IS RESPECTFULLY DEDICATED. London : Jones & Co., 1828. 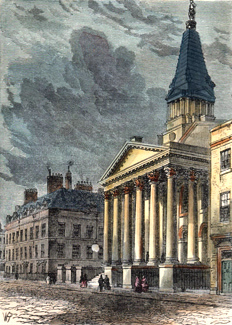 An elegant antique print – the pillared portico of the building by James Burton, the entrance to the baths, the corner of Little Coram Street, etc. The Institution was founded in 1808 for the “promotion of literary and scientific knowledge” – William Hazlitt lectured there and the antiquary Edward Wedlake Brayley was librarian and secretary. The site is now occupied by Witley Court. Engraved by James Carter (1798-1855) from an original study by Thomas Hosmer Shepherd. Originally produced for Shepherd’s part-work series “Metropolitan Improvements; or London in the Nineteenth Century” (London : 1827-1830). Steel line engraving on paper. Engraved surface 106 x 152mm (approx. 4-1/8” x 6”). In very good and clean state. A guaranteed genuine antique print. Adams 154/119. 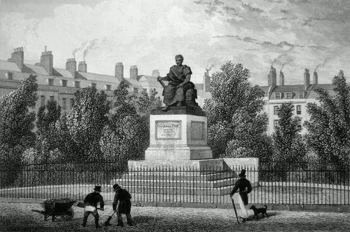 SHEPHERD, Thomas Hosmer, 1793-1864 : RUSSELL SQUARE, AND THE STATUE OF THE DUKE OF BEDFORD. [London : Jones & Co., 1831]. A charming antique print – the railed gardens of the square with the Richard Westmacott statue of Francis Russell, Fifth Duke of Bedford – and in the foreground a man in a cap drums up business for a Punch and Judy show. Engraved by Charles Mottram (1807-1876) from an original study (now in the British Museum) by Thomas Hosmer Shepherd. From Shepherd’s series “London and its Environs in the Nineteenth Century” (London : 1829-1832). Steel line engraving on paper. Engraved surface 109 x 152mm (approx. 4-1/4” x 6”). In very good and clean state. A guaranteed genuine antique print. Adams 161/124. 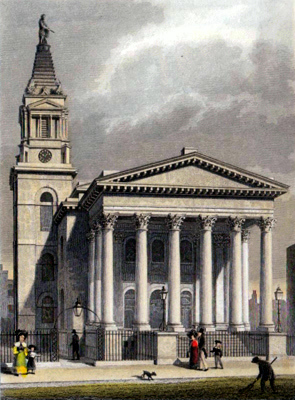 [SHEPHERD, Thomas Hosmer, 1793-1864] : ST. GEORGE’S, BLOOMSBURY. [London : Jones & Co., 1832]. 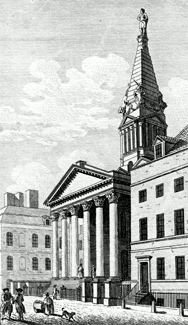 An attractive antique print – the exterior of St. George on Bloomsbury Way – completed to the designs of Nicholas Hawksmoor in 1731. Engraved by William Deeble (1791-1861) from an original study by Thomas Hosmer Shepherd, the master recorder of nineteenth-century London. Originally produced for Shepherd’s part-work series “Metropolitan Improvements; or London in the Nineteenth Century” (London : 1827-1830). Steel line engraving on paper. Later hand colour. Engraved surface 114 x 80mm (approx. 4-1/2” x 3-1/8”). In very good and clean state. A guaranteed genuine antique print. Adams 161/157. Steel line engraving on paper. Engraved surface 114 x 80mm (approx. 4-1/2” x 3-1/8”). In very good and clean state. A guaranteed genuine antique print. Adams 161/157. [SMITH, Adam] : [BLOOMSBURY SQUARE] VIEW OF BEDFORD HOUSE. [London : John Cooke, 1777]. A plain and elegant eighteenth-century print of old Bedford House, long since demolished to make way for Bloomsbury Square. Originally engraved by the Strand engraver Adam Smith (fl. 1763-1770) for Henry Chamberlain, “A New and Compleat History and Survey of the Cities of London and Westminster” (London : 1770) – and here in the slightly later and slightly altered impression utilised for Walter Harrison, “A New and Universal History, Description and Survey of the Cities of London and Westminster” (London : 1775-1777). Copper line engraving on paper. Engraved surface 116 x 167mm (approx. 4-5/8” x 6-5/8”). Trimmed a little close, but in very good and clean state. A guaranteed genuine antique print. Adams 57/037B. 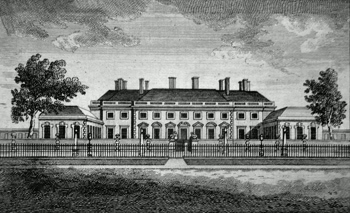 WALE, Samuel, 1721-1786 : BEDFORD HOUSE. [London : R. & J. Dodsley, 1761]. A charming eighteenth-century print of Bedford House (formerly Southampton House) – the house taken down by the fifth Duke of Bedford in 1800 to become part of Bloomsbury Square (nos. 18-27 occupy the site). Engraved by Charles Grignion (1717-1810) from an original study by the painter and illustrator Samuel Wale, first Professor of Perspective at the Royal Academy. Originally produced for Robert Dodsley’s part-work compilation, “London and its Environs Described” (London : 1761). Copper line engraving on paper. Engraved surface 86 x 141mm (approx. 3-3/8” x 5-5/8”). Very faint crease, but in very good and clean state. A guaranteed genuine antique print. Adams 41/014. 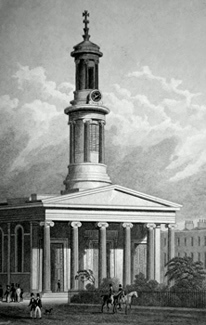 WALE, Samuel, 1721-1786 : BLOOMSBURY CHURCH. [London : R. & J. Dodsley, 1761]. A charming antique print of the Hawksmoor church of St. George Bloomsbury, with good detail of the extraordinary spire. 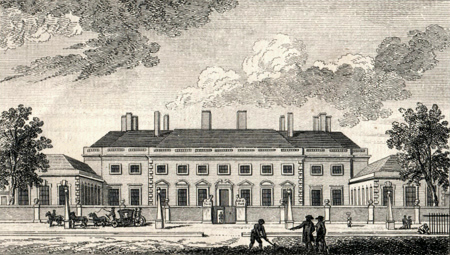 Engraved by William Elliott (1727-1766) from an original study by the painter and illustrator Samuel Wale, first Professor of Perspective at the Royal Academy. Originally produced for Robert Dodsley’s part-work compilation, “London and its Environs Described” (London : 1761). Copper line engraving on paper. Engraved surface 152 x 82mm (approx. 6” x 3-1/4”). Tiny flaw to paper at upper neatline, but in very good and clean state. A guaranteed genuine antique print. Adams 41/035. Return to London West Central index page.